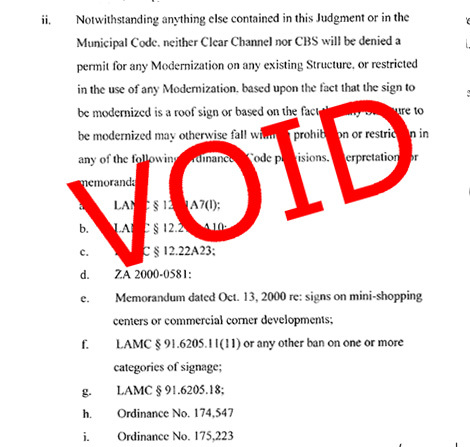 Superior Court Judge Terry Green ruled today that the lawsuit settlement giving Clear Channel and CBS Outdoor the right to convert 840 conventional billboards to digital violated the law by exempting those conversions from any zoning regulations or requirements for notice and public hearings. The city’s current off-site sign ban prohibits both new billboards and modifications to existing ones, so there doesn’t appear to be any way the companies could get new permits if the existing ones are voided. Whether or not that would force the companies to remove their digital billboards is unknown. Today’s action comes more than two years after the Coalition to Ban Billboard Blight filed a court action to block the lawsuit settlement approved by the City Council in September, 2006. That action, which made many of the same arguments cited by Judge Green, was rejected by another Superior Court judge on the grounds that the organization did not have standing with the court because its members could not show they were harmed by the settlement.